Firewalking to success – Strength doesn’t come from what we can do. It comes from overcoming the things you once thought you couldn’t. Next week The Mumpreneur Networking Club Team will be Firewalking in aid of St Catherine’s Hospice on Friday 23rd March. Our Team for the event is Sara Guiel, Nicky Chisholm, Jenni Beckwith, Marian Timms, Jess Haslett, Sandra Da Silva-Creasey, Charlotte Stanbridge. Heather Johns, Viv Lambert, Kate Nicholson, Holly Stone and Suzeck Taylor. We are on target to raise over £1800 for St Catherine’s Hospice. We asked our team why they wanted to walk across burning coals? After all, it is scary, it defies all laws of survival and common sense – so why have they stepped up? But first an introduction to firewalking? Firewalking is the act of walking barefoot over a bed of hot embers or stones. Walking on fire has existed for several thousand years, with records dating back to 1200 BC. Cultures across the globe, from Greece to China, used firewalking for rites of healing, initiation, tests of strength, courage and faith. Most importantly, we all wanted to know if we would burn our feet? Physics has explained the phenomenon, concluding that the amount of time that the foot is in contact with the ground is not enough to induce a burn, and combined with the fact that embers are not good conductors of heat means our feet will be burn free. Without a doubt, walking on fire will be outside everyone’s comfort zone, but we all know the magic only happens when you operate outside this zone. When you do “things” outside your natural parameters that is when you grow, learn and understand that you are actually capable of more than you think. As you establish your capabilities of dealing with difficult and challenging events, it increases your ability to deal with everyday problems and life’s many curveballs. Setting yourself a goal which is achievable and measurable will increase your motivation to reach the end goal, it keeps you moving forward every day and stops boredom and apathy setting in. Achieving your daily goals, with the end game set, is chicken soup for your soul! It will help you find your mojo! Don’t let fear stop you from doing things. When you operate outside your comfort zone, you will allow yourself to get comfortable with being uncomfortable! You will slowly become more confident, manage your doubts and find strategies to squash your negative thoughts. The more your challenge yourself, the more you will be comfortable with managing the unknown and creating your own strategies to find success. You can’t beat that feeling of crossing the finishing line! But it is not the immediate physical and emotional response that is etched in your brain, it is the memory of success and pride that stays with you forever. It has created change in your inner confidence, and this inner confidence is stored and ready to be used for all your future challenges. When was the last time you were proud of yourself? Not that recently we would imagine! You can’t beat being part of a team. You have automatic support, friends which can open doors into new opportunities. Your team can provide you with words of motivation, comfort and encouragement. Plus most importantly you have a readymade party for when you achieve your goal. Don’t underestimate being part of something greater than yourself. Other people often see in you, your potential that is just waiting to burst out. In a team you can feed off the energy and positive vibes of the collective and this can allow you to keep your inner negativity in check. You are actively placing yourself in a position to create change in yourself. If you are positive, you will attract positive people and that is where you will find opportunities and your pathway to success. The MNC Team are counting down to March 2nd, we are looking forward to firewalking with excitement and trepidation! We will report back and let you know how it goes! 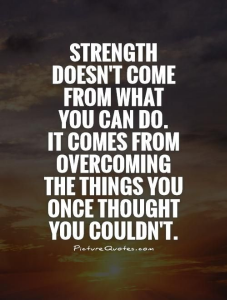 Strength doesn’t come from what we can do. It comes from overcoming the things you once thought you couldn’t.